In an "admittedly desperate bid" to save about a hundred rhinos from the persistent threat of poachers in South Africa, conservationists are air lifting these endangered animals to safer parks in Botswana, where the danger posed by poaching is less severe. Photograph by Beverly Joubert, featured by permission of National Geographic. 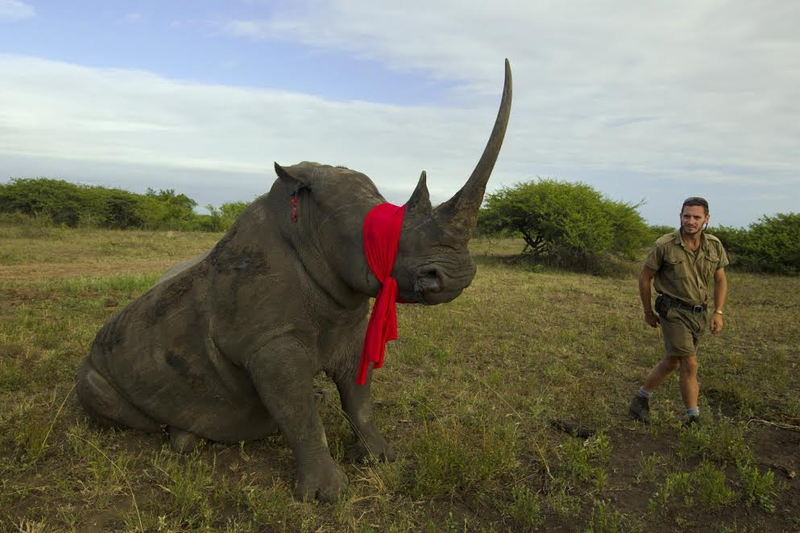 This pregnant rhino was blindfolded "before being moved to a staging area, as part of a journey that will end in a park in Botswana." There are an estimated 4,000 to 5,000 black rhinos and 20,000 white rhinos left in Africa, with another one killed by poachers every seven and a half hours, says Joubert, a National Geographic explorer-in-residence. That's more than a thousand rhinos slaughtered a year, mostly so their horns can be hacked off and sold in China and Vietnam on the black market. [ Dereck Joubert, a wildlife filmmaker and conservationist based in Botswana's Okavango Delta,] and his wife Beverly launched a nonprofit campaign last year calledRhinos Without Borders, which recently moved ten rhinos from overcrowded reserves in South Africa to an undisclosed staging area in a protected part of the country. The animals are being treated for illnesses and parasites. In a few months, they'll be flown by cargo plane to another undisclosed location in a park in northern Botswana. According to Joubert, airlifting the rhinos is more expensive than overland transport, but offers higher security from poachers. As Leana Hosea recently reported for the BBC, the superstition and mysticism surrounding the medicinal properties of rhino horns has given rise to a market in which a single rhino horn can be sold for a quarter of a million dollars (the $65,000 dollar-per-gram price point that Joubert cites makes rhinoceros horn worth more, gram for gram, than diamonds and gold), and a violent clash between poachers and those who would protect the animals. Last year, Hosea reports, a record 1,215 rhinos were slaughtered for their horns in South Africa, and 42 poachers were killed by rangers and police. Read Brian Clark Howard's coverage of conservation efforts at National Geographic. For more on the lucrative and bloody business of rhino poaching, including an interview with a 27-year-old man for who says he poaches because it enables him to feed his family, see Leana Hosea's reportage at BBC News.